A multi-purpose knife with a unique hooked blade. 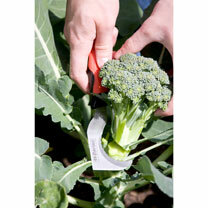 Use it for weeding, especially between paving, cutting cabbages, courgettes, cauliflowers, etc. and many other tasks. Stainless steel blade for rust resistance and soft grip handle. Length 19cm.